Before reading this, I’d like you to take a minute – a literal minute – and do something else. Anything will do. Stretch your legs. Freshen up your cup of joe. Look out the window and appreciate the scenery… I’ll wait. Over the span of those 60 seconds, 300+ hours of brand new video content were uploaded to YouTube. Let that sink in for a moment. Suddenly, you’re starting to get why the lack of engagement on those funny cat videos you keep uploading, huh? YouTube’s just that massive, a multimedia-meets-social-network platform. So much so that it can be a little disheartening just to stop and consider the sheer volume of data you are attempting to compete against, trying to make your videos stand out. Good thing is, it’s not all doom and gloom. Those numbers can (and do, actually) also work in your favor! For as much competition as there is on the site, there’s also an equally staggering audience. Around 30 million people tune in daily to watch things on YouTube, and that amounts to an audience that consumes over a billion hours of content each day. Yes, billion with a b. So, even though the competition is fierce, the numbers are there to support a stunning opportunity to connect you with a massive audience. An audience interested in your content. An audience that needs the solutions that your product can bring. An audience waiting to interact with your brand, even if they don’t know it yet. But to reach them effectively, you need to start using the tools and know-how on video SEO that can put you on a leveled playing field with the pros on the platform, and give you an edge over everybody else. You need to start taking advantage of those fundamental techniques specifically tailored for the platform. Those that can get your channel to grow in views, likes, and that audience engagement your content deserves. You need to start doing YouTube SEO. Ready to get started? Awesome! 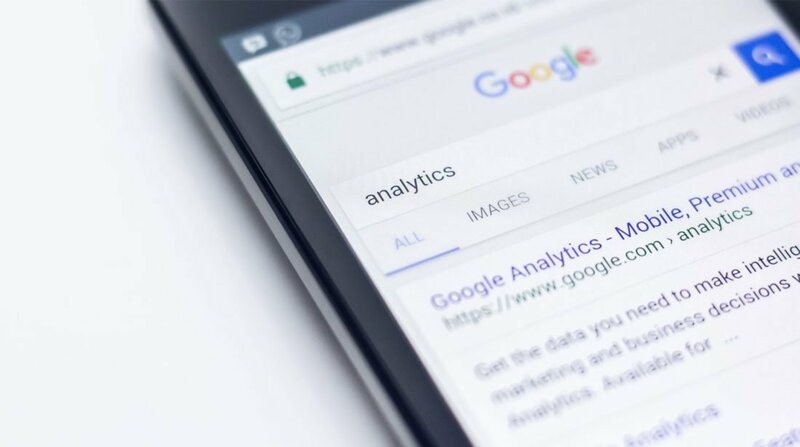 Let’s hit the ground running with one of the basic building blocks of search engine optimization: Keyword Research, and how it works in the context of the platform. So, instead of rehashing the concept and going over its role in generating traffic online, let’s instead focus on how the whole thing works specifically for YouTube. And how it differs from what you’d do with it for, say, a blog piece. Traditionally, when you consider keyword research for things like on-page optimization and text-oriented SEO, your aim is to usually discover the words that your potential audience is using to find the kind of content you provide. Then include them repeatedly in things like titles, tags, the body of a blog post, etc., to try and get the search engines to notice you and give your content priority in the SERPs. And even though there’s certainly some of that when it comes to optimizing YouTube’s videos (something we’ll get into in a little bit,) the fact is that the bulk of your videos view’s won’t come from google searches, or even YouTube searches for that matter. On average, searches amount for anywhere between 15 and 25 percent of your video’s traffic, while the rest actually comes from YouTube’s “Suggested Videos” and “Browse Features” options. However, your priority as far as SEO on the platform should be optimizing for these aspects first, and moving onto incorporating keywords into critical areas once those concerns have been taken care of. That’s the path to maximizing exposure. When it comes to keyword research for YouTube SEO, there’s an issue with how most people tend to go about it on the platform. And it’s something I’d like you to avoid. While resources like Google’s Keyword Research Tool do a great job suggesting relevant keywords when optimizing for search engines like Google, Bing, or Yahoo, they can be very ineffective if you try to translate their suggestions 1 to 1 to an enclosed ecosystem like YouTube. The thing is that people, your audience, uses both platforms in very different ways. So, to make sure you maximize your returns for the effort and time you are putting into research, you might as well use the proper tools, and go to the proper places for the information in which keywords you should focus on. A lot of people get surprised when I open up with this one. I’m talking about that drop-down window that appears whenever you input some words on YouTube’s search bar. Do not underestimate the value and effectiveness of the information you can get there. Here’s YouTube literally letting you know exactly what it thinks you might be looking for based on the word(s) you just entered. It is suggesting relevant, related topics that most people doing the same search you are ended up going for, or showed interested in. And yet, lots of people dismiss this information. 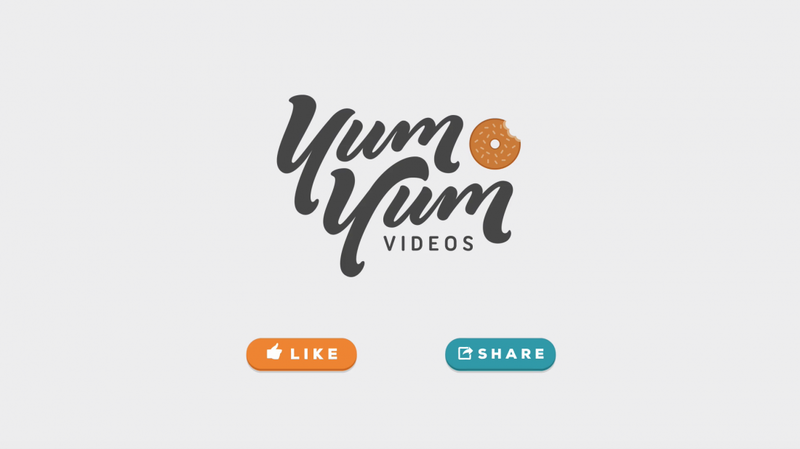 For example, our company Yum Yum Videos is an animated video production company, so we usually try to rank for keywords like “Explainer Video” which is highly sought after. Instead of just settling for that one and having to contend with the competition, it is a good practice to go through YouTube suggestions and see if there are viable alternatives that might work better. Notice that just the third suggestion “explainer videos for business” isn’t a huge departure from our initial one. Furthermore, long tail keywords (keywords composed of three or more words) tend to be easier to rank for the more straightforward ones. It sounds like a fairly simple strategy, but do not underestimate it! Just by applying this simple approach we’ve managed to get some incredible results, having some of our videos reaching 250k views organically with a very limited ads budget at the beginning of the campaign. So, whenever you’re doing keyword research for video SEO, be sure to run your potential picks through this option and pay attention to the suggestions. Get a sense of the related topics popping up and start picking possible keywords you should be focusing on. 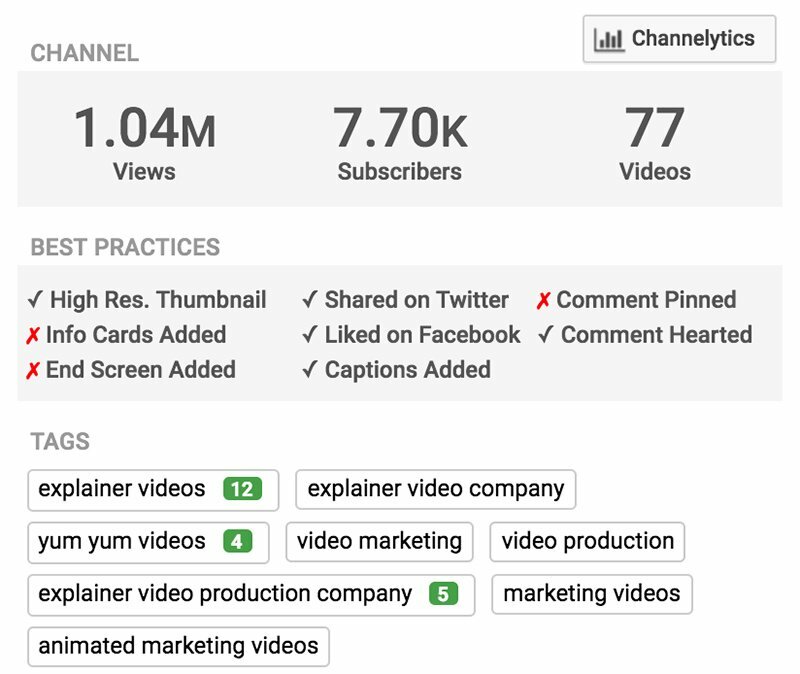 A tool that can complement your keyword research efforts nicely, TubeBuddy is an easy to use Google Chrome extension, and it can give you valuable insights about the tags your competitors are using for their videos. Once installed, just drop by their videos and click the “tags” tab. You’ll see a list of the tags the video is ranking for accompanied by a small green number representing the rank that the video has for those tags in terms of YouTube searches. Use this tool to find out the tags your competition is going after, and use the information to stay ahead of the game. Avoid going head-to-head against content that’s already too well positioned, and focus your efforts on poorly-optimized videos ranking for keywords that interest you. You can probably overtake them by producing quality videos that are fully optimized. To wrap up the basics of KR for YouTube SEO, let’s touch upon your channel’s very own analytics. This is a particularly important strategy to keep in mind if you have already been putting out content for a while (regardless of success) because it can let you hone in on good keywords you’ve arrived at organically, or warn you about subpar keywords that have not worked in the past and should be avoided. Go to your YouTube Dashboard, then to the “Analytics” section, and click on “Traffic Sources.” Select “YouTube Search” and you’ll get back a list of all the keywords you are ranking for. Take your time and do comprehensive research on the right keywords for your content, they are the basic building blocks of your optimization strategy and you’ll need them to inform all instances of your production process. From topic selection to content, to final optimization. Once you start implementing them effectively, you’ll even be able to improve previously ineffective videos and focus future projects around them to get their full benefit. Organically racking up those views and growing your audience as you start producing amazing optimized content. Everybody wants to make that amazing video which resonates with their audience and brings in the numbers. The thing is that not everybody agrees on what exactly an “amazing” video is. Or better said, “amazing” is a relative term that means different things for different people. Even if you try to go about it objectively, quality indicators vary greatly by niche, topic, target audience, etc. Lastly, you need to understand that what’s “amazing” for you isn’t necessarily so for YouTube’s algorithms or your intended audience’s tastes for that matter. YouTube’s algorithms measure the success of content based on a handful of important metrics. Understanding, and trying to hit certain marks within them will have said algorithms giving your content priority over those that do not. Being aware of these things will help inform your decision-making process as you set out to produce new videos. And will help guide your content in a direction hailed as “amazing” by everybody involved. TWT is probably YouTube’s most important ranking factor when it comes to video SEO, and it refers to the total time people spend watching your video. The more time people remain engaged with your content, the happier they are, and the healthier the whole platform becomes. Thus, YouTube prioritizes content that achieves higher TWT. At this point, you might be wondering how you can possibly optimize for this aspect. After all, you can’t control how much time someone decides to spend watching your content online, can you? A basic strategy you can start using to improve your TWTs is actually quite simple, and it revolves around creating longer videos. Statistically speaking, people will watch your content roughly until the 40% mark most of the time. Which means that if you produce two videos, one lasting 3 minutes and another 6 minutes long, the second will – on average – rack up twice as much TWT. It might sound a bit counter-intuitive at first since common wisdom of the industry often suggests shorter videos to accommodate viewers’ short attention spans. However, a recent study carried out by Backlinko found that longer videos significantly outperform shorter ones, making this a valid strategy on your YouTube SEO efforts. Something important to keep in mind here is that striving to create longer videos isn’t an excuse to start artificially inflating their length. Rather, it is just an opportunity not to shy away from longer-form content that you might have actively avoided in the past. Audience retention is another big metric YouTube favors when deciding which videos to prioritize. Closely related to TWT, it actually speaks to a different prism of the same topic. Audience retention is depicted as a percentage, and described by how much of your video is being watched by most people. Unlike Total Watched Times, audience retention is a more accurate portrayal of your video’s ability to capture and maintain your audience engagement. And there are actually a few strategies you can use to improve this metric. Firstly, know that the first 15 seconds can make or break your video. Even YouTube suggests paying extra attention to the initial parts of your videos since most people decide whether to drop it or watch it based on these first few moments. Then, make sure to take a closer look at your videos’ audience retention reports and determine the areas of max retention and higher drop-offs. Review your content and what happens at these critical intervals to try and figure out do’s and don’ts that resonate with your audience. Lastly, try and incorporate pattern interrupts in your videos. A pattern interrupt is a marketing strategy where you do something unexpected, or slightly out of tune with an established flow, to capture or retain a viewer’s attention. Introducing pattern interrupts as part of your content might be just the ticket to improve those audience retention numbers. Want a great example of this? Just see how the guys at Dollar Shave Club manage to hit all these points marvelously, resulting in awesome video SEO. A list of essential YouTube SEO metrics would not be complete without at least touching on user engagement. As a general principle, you don’t just want your viewers to simply sit back and watch your videos. The ideal viewer also engages with the other important elements of the platform: liking, commenting, subscribing and sharing your content. The more people tend to do this on your videos, the more YouTube will prioritize them. These actions speak directly to the quality of your videos and channel as a whole. And give evidence of content that should be spread. Luckily, there are a handful of tried and true strategies that work well with generating these responses from your viewers, and the first one might surprise you with its simplicity: Ask them to. By simply exhorting people to leave a comment, drop a like, and share the content they enjoyed, they are far more likely to actually do it than if you simply left it for them to think of doing so. Another good habit is to always include a “Subscribe” call-to-action at the end of every video. Finally, the key to having viewers active in your video’s comment section is for you to be active as well. Engage with them, reply to their insight in a positive light, and you’ll build a community that comments regularly. As you can see, these metrics range around all stages of your videos’ creation. From conceptualization to post-upload analysis and catering. By following the advice in this section and minding these metrics on your content production, you are well on your way to having optimized videos that nurture your channel. Yet, there’s still a final area of optimization you should take advantage of to have a top-notch SEO optimized channel. So let’s go over it and the best way to do it. So, you did your research and used that information to guide your topics and content. Then went over the most important metrics YouTube gives priority to and created an amazing video that accounted for them and now sits ready for you to hit that publish button. But before you do, there’s one more thing I want you to take care of to have a truly flawless, shiny new video driving traffic to your channel. And it is all about on-page optimization. As I mentioned before, once you have the relevant keywords you are focusing on, you need to incorporate them on a couple of critical sections that YouTube’s (and Google’s) algorithms pay particular attention to, thus enjoying the full benefits of a completely optimized video. Your titles are there to serve two vital purposes: To let YouTube know what your video is about, and capture your potential audience’s interest well enough to have them click and engage with it. The first one is fairly straightforward. Just include your main keyword once in the title to optimize video SEO. Do this, and YT’s algorithms will index your content as relating to that particular topic. Anyone searching for those words (or related ones) will have a chance of having your video suggested to them. The second is a bit more involved and requires you to be creative, interesting, and honest. Your video titles should accurately portray the nature of your content and the information within, and do so in an interesting, compelling way that captures your potential viewer’s interest. However way you go about it, you should always keep in mind an important principle: Do not sacrifice user-friendly content for search engine optimization. Your titles should primarily cater to capture the interest of humans, and adding keywords and optimizing them should remain a secondary priority. Descriptions are a really valuable section that often goes underused on most YouTube videos. Use descriptions to give a comprehensive overview of your video’s content, provide further information on the points you make in it, and provide links to related videos you think people watching might also be interested in. This way, you are not only letting YouTube know more in depth what your video is about but are also building viewer confidence and nurturing your channel by leading people into more of your content. Aim for longer descriptions but don’t overdo it. Try to at least hit the 200-word mark. Lastly, always try to mention your main keyword a few times in your video’s content. 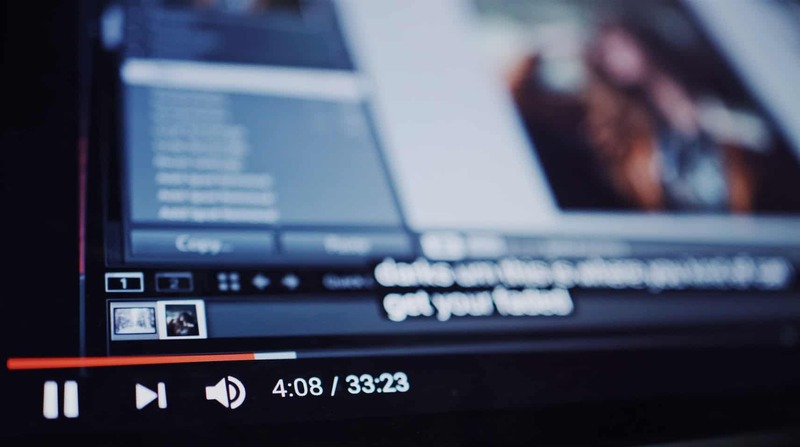 For one, YouTube can understand most of the words being spoken in a video and uses this information to generate context when indexing its topics and displaying them in searches. Thus, directly influencing your video SEO. Including a video transcript also helps in this regard and you should try doing so whenever possible. There are many other ways in which you can improve your YouTube content’s optimization, however, the areas we covered here form the baseline you need to start taking care of before moving on to other, more involved strategies. By doing the proper keyword research through the proper channels, optimizing for the metrics YouTube gives priority to, and taking care of the due diligence of covering all relevant SEO-enabled sections of a video page on the platform, you are well on your way to start growing your channel organically and generating those views and subscriptions you want. A great video is only possible by choosing the best video production company to make it! If you’re looking for it, check out our guide below, or just contact us, we’ll help you bring your message to life.